In "Bouquet Et Architecture Horizontal" tapestry we see a balcony ledge strewn with roses and flowers. The elements of architecture in this exquisite floral arches tapestry shows the balance of architecture and nature most beautifully. Here a high ledge with columns and arches in the surrounding village shows the Romanesque architecture highlighted by a bright bouquet of flowers glistening in the sun, as well as deep crimson drapes near the blooms as well as on the adjacent ledge. The red drape has been used in French tapestry production to synbolise beauty and luxury since the 18th century. An elaborate border with emblems and flowers surrounds this glorious scene. 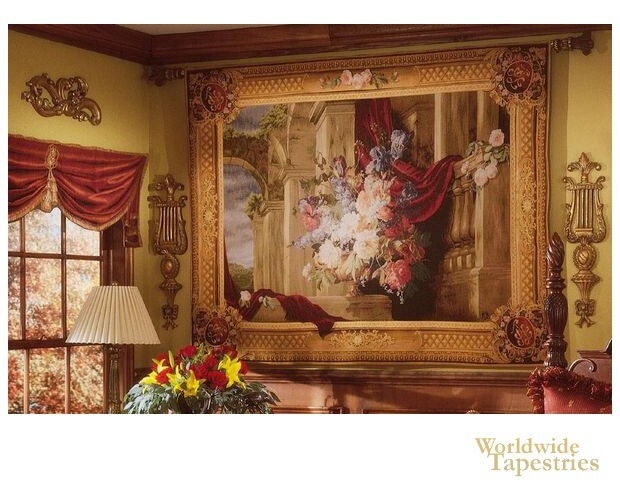 "Bouquet Et Architecture" tapestry is backed with a lining and has a tunnel for easy hanging. Note: tapestry rod, tassels and accessories, where pictured, are not included in the price.